So after what has seemed like a few month of snow every day, things have quieted down…if just for the moment. 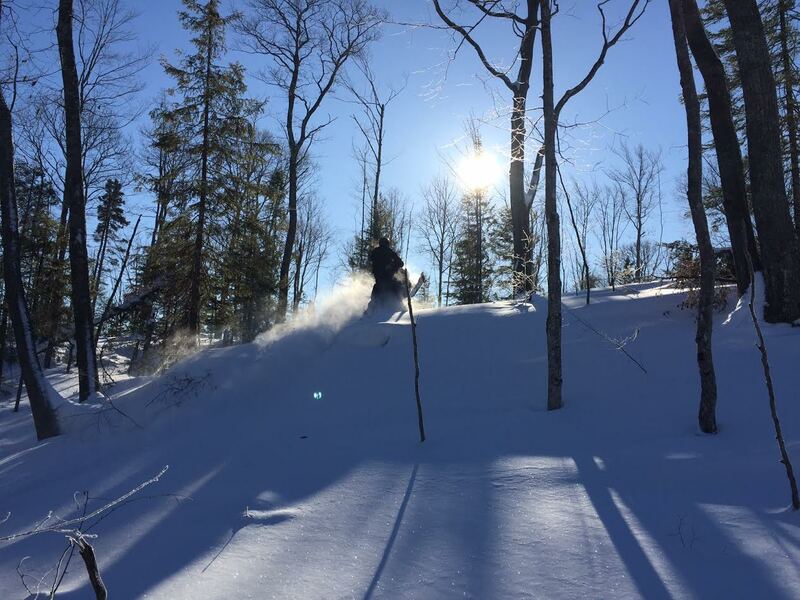 The snows tapered off on Friday and after a bit of light snow Saturday, things cleared and we were left with a beautiful, sunny day for Sunday that is being repeated today. I did not write yesterday, as I had friends up and did not want to disappear into the office for a few hours and leave them to have fun without me! I cannot remember the details of last week very well, but I do remember moving snow. 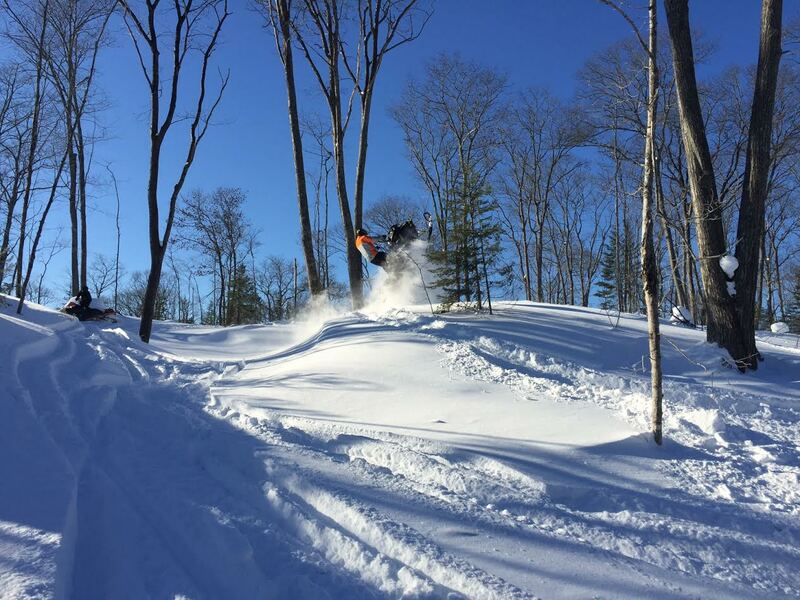 All told, we picked up another 23″ of snow last week, with much of it falling in the front half. I do remember going over to clear the ice rink one day and finding that the snow had drifted even with the tops of the boards! In the center of the ice, the snow was only around 12-15″ deep. None the less, it was quite the job to clear it off! Our driveway, as well as the neighbors driveway also took some time. I cannot remember which day it was, but I did have to clear the snow twice one of them. Now let me explain, I do not generally clear a second time in the day if there is generally less than 6″ new. I figure I can just let it wait until the morning and I will move what has freshly fallen and what will fall overnight. It’s interesting the routines you get into in snow country, versus living in an area where an occasional storm will deposit enough to have to move around. If someone wanted to keep their driveway clear at all times, they would either be doing it every few hours, or would just give up and go nuts watching all their hard work get covered back up in a few hours! As mentioned, we had some very strong winds blow this week, including an evening in which 50 mph gusts were reported at the airport and Stannard Rock (in Lake Superior around 30 miles north of the Huron Mountains) reported gusts to 78 mph. That is stronger than hurricane force. Needless to say, that did cause a fair amount of blowing and drifting of the newly fallen snow. Those winds did calm down in time to allow school to go on the next day, but the kidos did get a day off this week because the winds had kept up most of the night and roads were in bad shape in the morning. For those of you that view the cams up here on a fairly regular basis, you got to see a wall of white on the camera in Calumet at the Convention and Visitors Bureau. You might be thinking that the camera is poised fairly low in the window opening, but the reality is that it is mounted about as high as it could be. 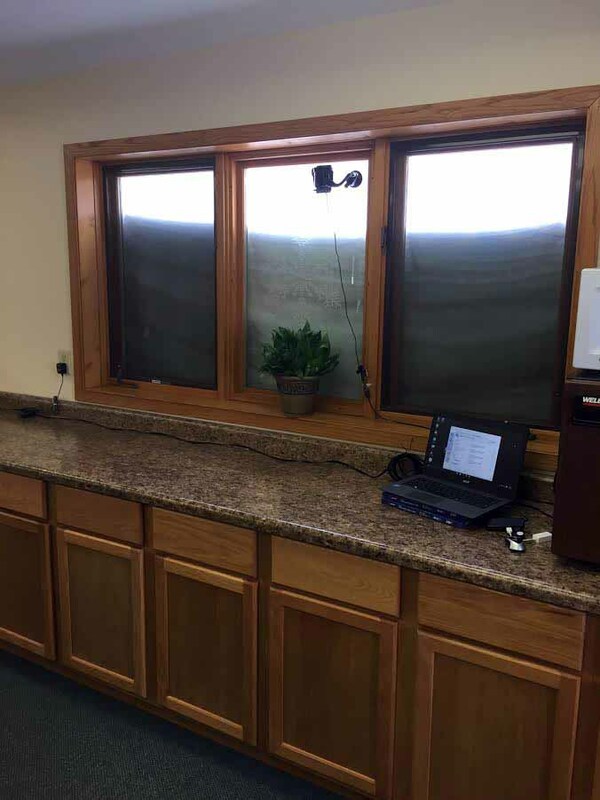 The drifting had blow snow right up to the top of the windows. The windows to the left of that bank had not yet drifted in completely yet, so I moved the cam to them and the view of the intersection of Hwy 41 and Mine St is back…For how long, I cannot promise! I was able to get out and play in the snow this week. It took until Saturday, but I managed to get out both Saturday and Sunday. I am not complaining here. It is all about priorities. I could step away from the computer and leave the work to do for a bit, but to tell you the honest truth, it was pretty chilly most of last week, so I did not have too much of a problem staying in and watching it snow. This week does not look quite as busy and with temps running at or a bit above freezing most days, I can see getting out to play quite a bit. Anyway, my friends arrived Friday evening and since it was suppose to get down into the single digits for Saturday morning, we had all planned to sleep in a bit and let things warm up a bit before going out. The sleeping in part worked well, but the temperature forecast did not. We only dropped into the low teens, so had we wanted to, we could have gotten an earlier start. 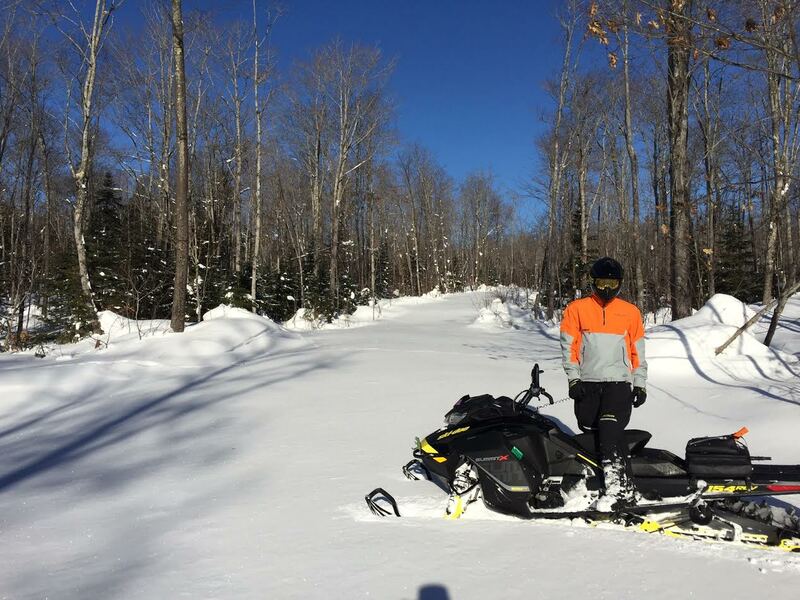 None of us seemed to be too disappointed in sleeping in, enjoying a nice breakfast, doing a few modifications on the sleds and then heading out. It hasn’t been just this past week that is has been too cold for this old buck to head out and play, nor has it been much of this season, but rather much of the past few seasons! Getting out on Saturday and riding with temps flirting with the freezing mark seemed quite unusual! Much welcomed, but unusual. Seems like the past few winters, we either are struggling to get enough snow to play in, or are getting it good, but are also very cold. Anyway, it was great to be out in the milder temps Saturday and here is a pose of Randy and Keith enjoying the weather and snow. The hill in the background was our task for the afternoon. We had already made it about halfway up the hill where that shot was taken, but it was a much easier part of the hill. So not long after the picture was taken, we decided to go for the top. I was first and probably made it around 40% of the way to the top from the picture spot, but ran out of talent and momentum! Please note that that picture was not taken with the camera tilted. I have seen others tilt the camera a bit to make the hill look steeper, but no such trickery here! 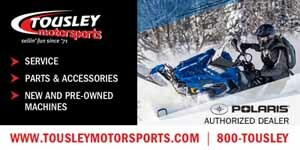 Here is a shot taken of me from back down the hill as I got the sled ready to roll over and get pointed downhill. The snow was quite deep there as well. 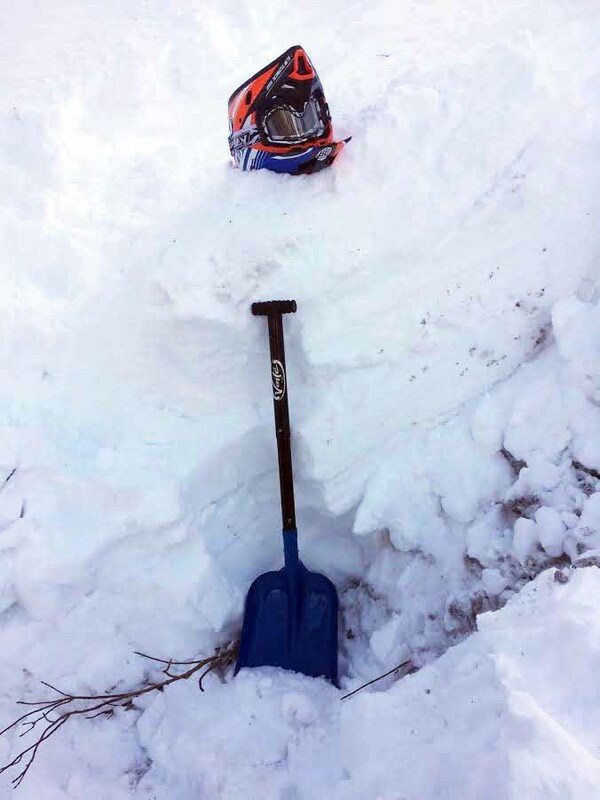 I ended up trenching to within a few inches of bare ground and could not take a picture of me in the trench to show you how deep things were, but here is my shovel leaned up against the side of the trench, with my helmet on top of the snow for reference. 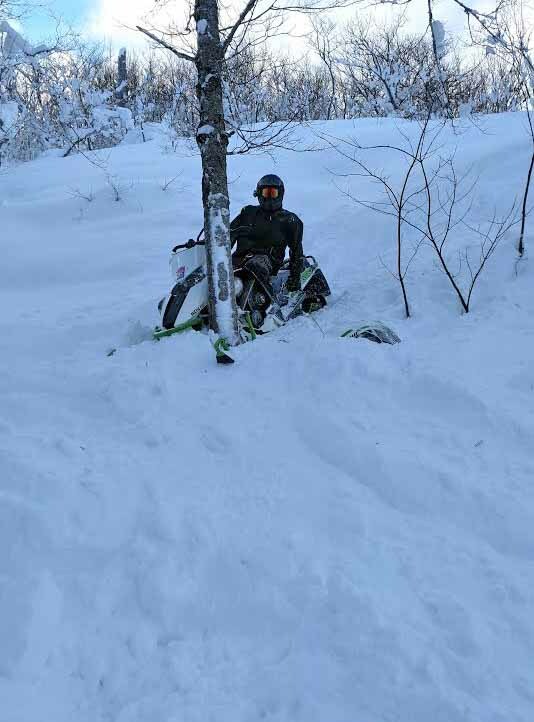 My stuck was not too bad and did not take much effort to get unstuck from. Next up was Keith. There are no pictures, only a video, but it is not too flattering, so I will refrain from publishing it as I would like to keep him in my good graces. I should have had the video running when Randy took his shot, as he made a great climb, with skis in the air about the whole way up. He started to lose momentum and made a very pretty turn out. That is where be beauty ran out and things got nasty. Not long after turning out, he found himself hugging a tree. Not sure if you saw it, but one of his side panels was laying in the snow next to him. There was a bit of carnage done. 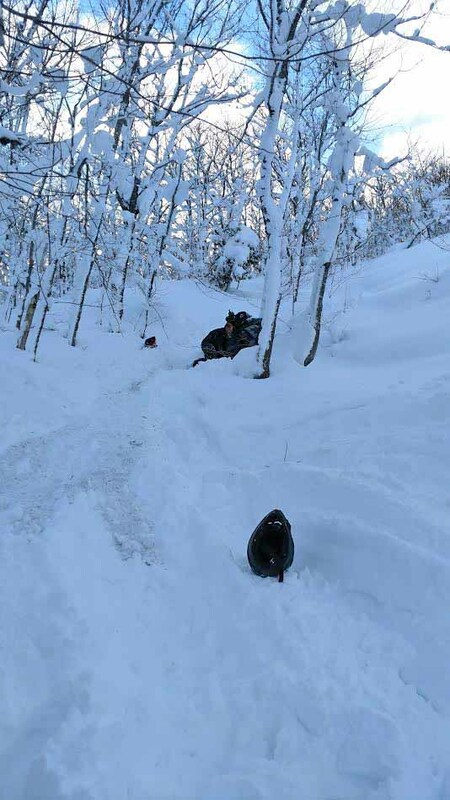 Not a lot, but enough that we ended up calling it a day after we all got down the hill and Randy’s sled put together enough to get back home. Ending the ride a bit early allowed us to head down to Hancock and pick up some replacement parts for Randy’s sled. We then came back north, were joined by Nora and Gracie and headed out to dinner. After dinner, it was into the shop to get the repairs done. I don’t know if it was the riding that day, or the awesome dinner or both, but I was really having a hard time staying awake in the shop as the two of them spun wrenches, so I retired around 10:30 and they finished up by around midnight. Sunday morning broke with blue bird skies. It was a bit chilly at day break, but did not take too long to warm up with bright sunshine. 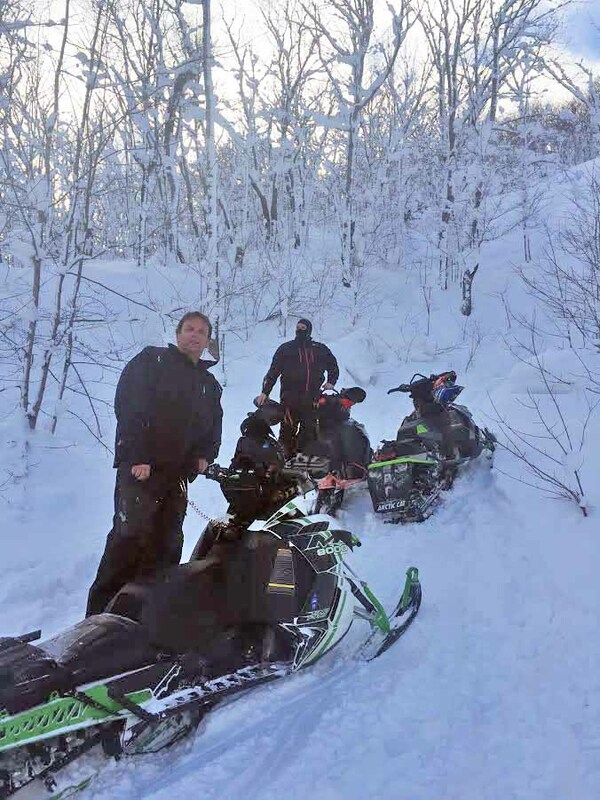 We were joined by two students from MI Tech that are also in the snowmobile club there and headed out for a full days fun. Sunday ride started with a bit of warm up play areas. Not flat ground, but no big hills either. It’s actually an area that I had never been to before, but had gone by. I think they might have even done some selective logging in there, as I do not remember the tree cover being so light. Anyway, it was a great area to play and get warmed up. Randy almost had a close encounter with a tiny tree, but was able to stop short and even back down a bit. A little bit later, we came upon another play area and we all had fun tooling around and finding different things to do. Here is Keith topping a little hill and here is Hunter, one of the Tech students popping his own wheelie. The rest of the day was spent cruising the Keweenaw in search of more spots to play. Sometimes the search is just as fun as when you get to the play spot, especially when you seem to have the whole woods to yourself. The rest of the day went quite well, with no major carnage. 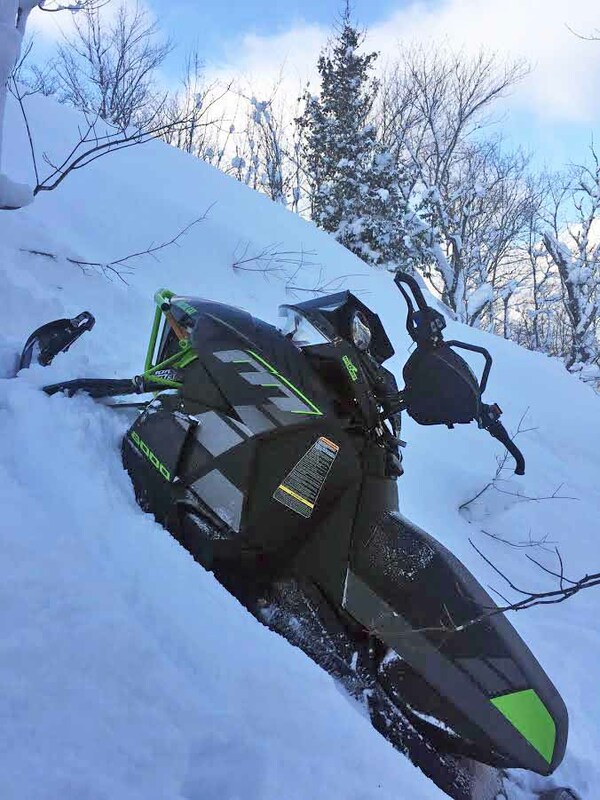 Randy did end up bumping his chin on the handle bar strap while performing a very tricky creek hop, but other than that no blood was shed and no sleds damaged! All told, we spent about 5 hours in the bush riding and never once came out, even to grab a bite to eat or warm up. No need to warm up, as temps were in the low 30’s and the sunshine made it feel like spring riding, but I was surprised as no one mentioned anything about taking a break. Sign of everyone having a good time I guess! 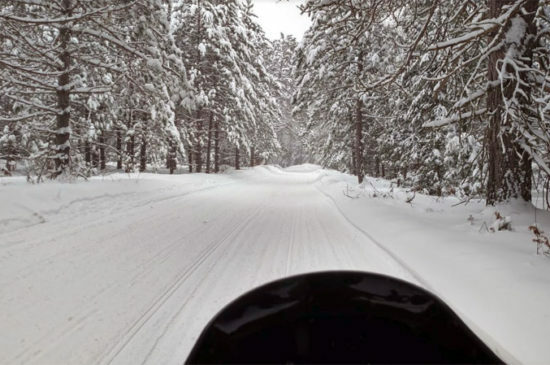 So I got my fill of riding in fresh snow for a bit, which is a good thing, as it looks like no new snow of significance will fall up this way in at least a week, maybe more. To tell you the honest truth, as long as we can get back into a regular snow cycle after this lull, I think I might actually enjoy it! It will be refreshing to not have to worry about clearing snow. 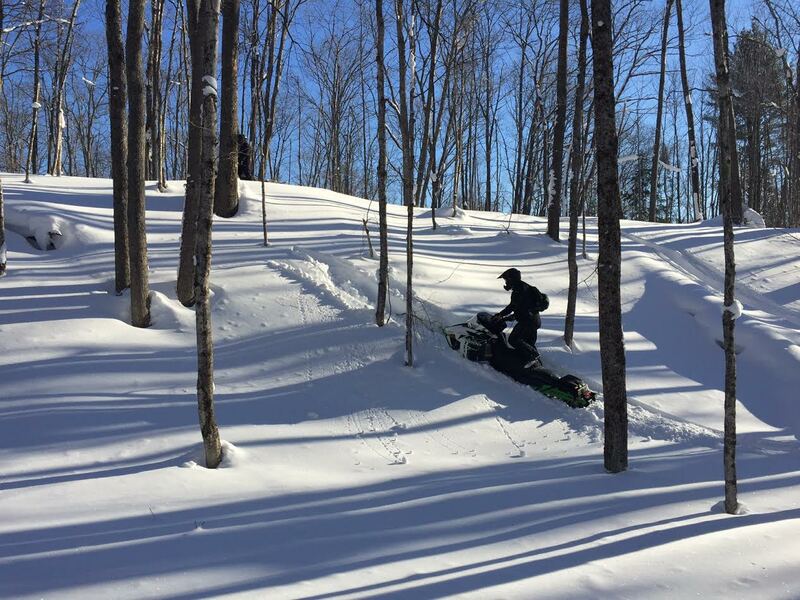 Temps look to be warm enough to get out and enjoy the ample amounts of snow we currently have. So here is to a snow-free week, which will hopefully be filled with plenty of snow for the end of January as well as all of February!